When most managers trial our system, their time is generally being consumed manually creating schedules via spreadsheets. It's for that reason that we allow for an easy import for .CSV or .XLS into our system. 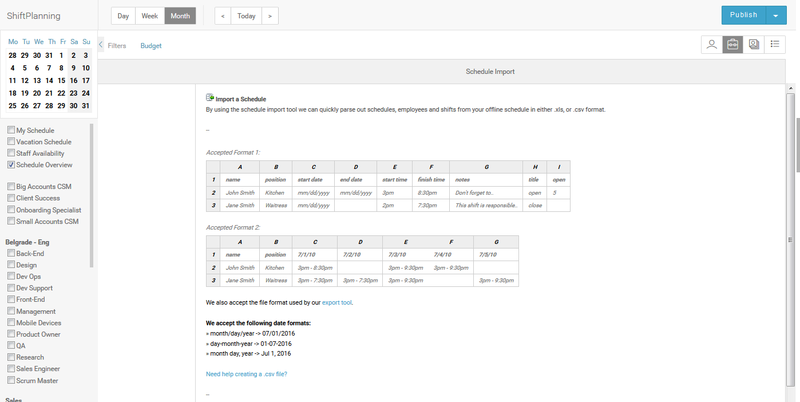 Importing an offline schedule into ShiftPlanning is the easiest and fastest way to bring in employees, schedules and shift times all at once. Go to tab ShiftPlanning and click the downward arrow icon beside Publish button. 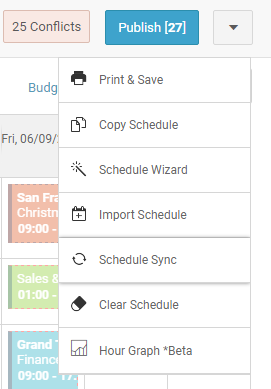 Select Schedule Import option there. Make sure the Position names and Employee names are exactly the same as they are in your system otherwise it will be rejected or there might be repeat Positions or Employees. Any special character e.g., (Ä/ä, Ö/ö, Ü/ü) etc.